For anyone interested in the story I'm working on, this is a first look at my model of the city of Tchahua. The deep water quay is front right; the bridge (front left) is roughly modelled on the medieval London Bridge, but without the buildings that were built on it. 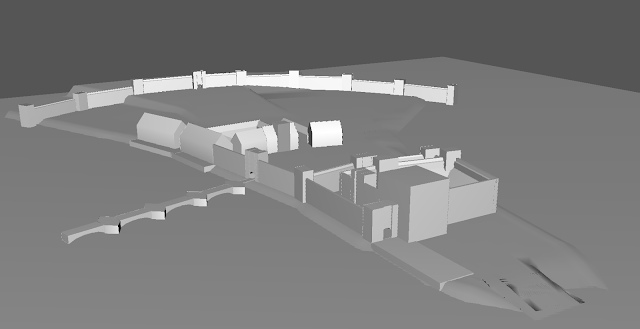 Obviously the castle (centre right) is the Residence; I've shown the outer ward walls lower than the inner ward, partly because for defence you would want to be able to shoot down on them if the outer ward was captured, but partly because it's a different phase of building - the outer ward would have been added when the deep water quay was developed. Facing the Residence (middle of the picture) is the guildhall and and a couple of large buildings which I'm currently vaguely thinking of as probably inns. I suspect there should be a religious building somewhere but I haven't got that worked out yet - there may be several temples because I don't think the Dragon cult is a state religion so there are probably other cults. Upstream of the bridge - left of picture - is the old harbour, which older, smaller ships could access through the lifting span of the bridge; the two large buildings on the quayside there are the silk warehouse and the spirit warehouse. I think the spirit warehouse is the one nearer the Residence, but again that isn't certain. The area between the guildhall and the Residence is the market place and will not be built on, but the area between the guildhall and the city wall should be densely packed with dwellings and workplaces. Upstream of the warehouses should be the richer merchants houses, probably quite grand. I'm viewing pitched roofs as probably because it's coastal with regular onshore winds drawn in by convection over the steppe inland; it's likely to have moderate rainfall. I haven't yet made up my mind about building technology, but I think there is a mix of mainly-timber and mainly-stone buildings. There probably isn't any brick because the local stone is limestone, so there are unlikely to be clay deposits. To the left of the city - under the bridge - is the eponymous river, which is the same river which runs underground under the city of Hans'hua. I'm not yet fully committed to what the arm of water to the right of the city is. It may be a shallow, marshy bay, or it may be another river. The city wall spans the peninsula from one shore to the other, but does not actually enclose the city. In the story there are sections of it which are in poor repair. Looking at this model it's obvious that there should be something significant at the end of the peninsula, bottom right of this view. I'm not yet sure what that would be. As I originally imagined it, the Residence pretty much was the end of the peninsula, but when I modelled it like that it didn't look like real geography. There must be a kink in the river downstream of the harbour, as at Kirkcudbright, for example, to shelter ships in harbour from storms. I haven't got the wider geography pinned down yet. Obviously this is the same continent as in my 'Modelling river systems' note, and the precise location of Tchahua is the estuary towards the western end of the south coast. But that's rough geography, and the benefit of it being my world is I can chop it around as suits me. There's a lot that isn't in this picture, yet. Obviously there need to be dereks on the quays, boats here and there, lots more houses, public wells - the stuff that makes a city viable. Also, this is a city which has grown considerably richer in the past decade and a half, so there should be a lot of building going on (which may be why the wall is in poor repair - people may have been robbing building stone out of the city wall.